For GE CEO Larry Culp, managing investor expectations is critical when trying to navigate a complex turnaround. And thus far, Wall Street likes what it hears. To the dismay of some investors, Culp on Thursday projected that GE's 2019 free cash flow would either be unchanged or turn negative by as much as $2 billion. But GE stock shot back up into positive territory, adding to a 10 percent gain since last week, when Culp first announced that 2019 cash flow would be negative. Explaining stock moves is tricky, but what may have helped calm investors was the already low expectations set by Culp's prior disclosure. The logo of General Electric is pictured at the company's site of its energy branch in Belfort, France, February 5, 2019. 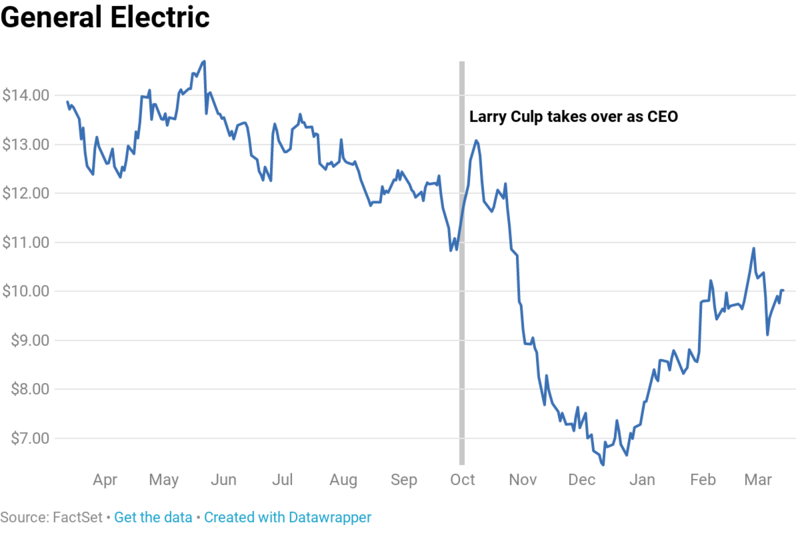 General Electric Chief Executive Officer Larry Culp had a lot on his plate during the company's 2019 outlook presentation on Thursday. Once the biggest public company in the United States, GE has shed more than $200 billion of market value since 2017. Its stock was booted from the blue-chip Dow Jones Industrial Average last year, and its accounting is under federal investigation. The formerly sprawling industrial giant is being dismantled piece by piece. For Culp, with billions of dollars and the fate of an American crown jewel in his hands, managing investor expectations is at the top of his priority list. And it looks like it's starting to work. Culp, on the job less than six months, has to try and win back the confidence of GE shareholders and employees and calm its detractors, and the numbers aren't helping. On Thursday, he projected 2019 earnings per share would come in between 50 cents and 60 cents, below the 70 cents Wall Street had expected. He also put details on a prediction he made last week: GE's cash flow this year will either be unchanged or or turn negative by as much as $2 billion. But Thursday morning selling in GE shares was contained. Nobody panicked. In fact, the stock ticked lower in premarket trading but then shot back into positive territory, up 4 percent at mid-morning and adding to a 10 percent gain since last week. Culp's step-by-step effort to keep shareholders in the loop, disclosing just as much information as he can without setting the bar too high, appears to have soothed some nerves and softened stock fluctuations. On every call he makes, there are so many constituencies," said RBC's General Electric analyst Deane Dray. "It's the investment community and it's all the internal – the employees – he needs to make sure he wins their hearts and minds, instill confidence." "You can hear it in his voice," Dray said. Culp took over as CEO on Oct. 1 with a long to-do list he is slowly checking off. GE recently announced the spin-off of its 111-year-old rail business as well as a sale of part of its stake in oilfield services firm Baker Hughes. Culp's track record as CEO of the science and technology conglomerate Danaher, where he more than quintupled market value and revenue over a decade, was supposed to give investors hope, but some remain unconvinced. GE is a much larger company, with revenue north of $120 billion and almost five times as many employees. Those with any meaningful financial stake in General Electric have likely been following headlines about its cash flow, a term used by analysts to describe any money left over after a company has paid for its normal operations. To the dismay of some investors, Culp on Thursday projected the company could burn as much as $2 billion more in cash than it makes this year. But the situation is expected to improve next year. "We have work to do in 2019, but we expect 2020 and 2021 performance to be significantly better," Culp said in a press release. Challenges should diminish, he added, and operational improvements should yield financial results. The relative calm in the stock after the disclosure could be because Culp had already prepared investors by saying last week the number would be negative, without specifics. "That's the hard part," said RBC's Dray, who has a buy rating on GE shares. "Everyone wants to hear all the specifics right then and there." Instead, on the third and fourth quarter earnings calls, Culp "was trying to sensitively explain and give a road map when he clearly did not have all the specifics yet." And remember: Culp and Dray are talking about estimates here. Investors will have to wait to see if 2019 cash is, in fact, negative. The forecast that cash flow would turn positive in 2020 and pick up more momentum in 2021 "is the biggest positive disclosure, in our view," Dray said in a note to clients. Culp's ability to manage expectations is far from unique. There is perhaps no CEO better equipped or better practiced at managing steep investor expectations than Apple's Tim Cook. Between a devout customer base, a hard-to-please investor pool and a one-of-a-kind predecessor, Cook had his work cut out for him on Day One in 2011. And it hasn't gotten any easier. Fears of plateauing smartphone sales appeared to peak on Jan. 2, when Apple lowered its first-quarter sales guidance, citing softer demand in China. Specifically, Cook et al. said Apple's revenue would be closer to $84 billion, down from the $89 billion to $93 billion it previously projected. "If you look at our results, our shortfall is over 100 percent from iPhone and it's primarily in greater China," Cook told CNBC at the time. "It's clear that the economy began to slow there for the second half and what I believe to be the case is the trade tensions between the United States and China put additional pressure on their economy." Despite the fact that Apple had topped Wall Street profit estimates in 19 of the last 20 quarters, shares sank nearly 10 percent the day after the disclosure and drew a deluge of worrisome analyst notes. Analysts from Jefferies and Macquarie each threw in the towel and downgraded the stock to a neutral rating from buy. "Biggest miss in years," Jefferies said in a note to investors. "The bottom line is that we are late (obviously), but we can no longer recommend Apple," Macquarie added. Oppenheimer said Apple's announcement "raises more questions than answers." Almost predictably, Apple reported both a profit and sales that were better than expected a month later, and its stock remains more than 25 percent above its Jan. 3 close. In fact, annual revenue under Cook has more than doubled in his eight years at the helm and earnings per share have tripled. Apple's cash hoard has ballooned to $245 billion as management eases the company toward a recurring, service-based model, opening the door to M&A and other strategic moves. The point is that it's actually easy to overlook the success Cook and Apple have had over the past several years by fixating on current iPhone sales trends, a short-term view that billionaire value investor and Apple stakeholder Warren Buffett has repeatedly criticized. The "Oracle of Omaha," who actually owned GE preferred stock during the financial crisis, has for decades touted a strategy of buying no-nonsense stocks and long-term investments in favor of trying to time the market based on short-term outlooks. Instead, he's focused on long-term fundamentals: whether or not Apple or General Electric equity looks cheap over a five- or 10-year horizon. "The idea that you're going to spend loads of time trying to guess how many iPhone Xs ... are going to be sold in a three-month period totally misses the point," Buffett said in a "Squawk Box " interview last year. " "Nobody buys a farm based on whether they think it's going to rain next year," he added.